A hole has appeared in a canal near Leek, Staffordshire, causing gallons of water to flood the surrounding fields. 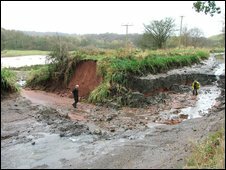 A 50ft (15m) section of the Caldon Canal east bank and towpath collapsed at about 0530 GMT. British Waterways, which manages the UK's canal network, said an engineer inspected the site on Friday and said there were no signs it would give way. The canal has been closed from Bedford Street lock in Etruria to Stockton Brook, at lock nine. Planks have been used to create a temporary dam and British Waterways said it was also working with ecologists to rescue fish from the flooded fields. A spokesman added: "An engineer was down there on 6 November looking at that section and he said there was nothing obvious to suggest that a breach might take place." Julie Arnold, a volunteer for Inland Waterways Association, a group that campaigns for canal maintenance, said: "It's an important stretch because it connects Rudyard Lake reservoir to the national canal network in Stoke-on-Trent." She said breaches were not common but one had occurred recently on the Shropshire Union Canal. The stretch in question, at Shebdon Embankment, Staffordshire, was closed after it began to leak in August.